The San Francisco Museum of Modern Art (SFMOMA) opened to incredible fanfare on Saturday, as thousands eagerly poured into the newly renovated museum that nearly tripled its gallery space after a three-year expansion project. 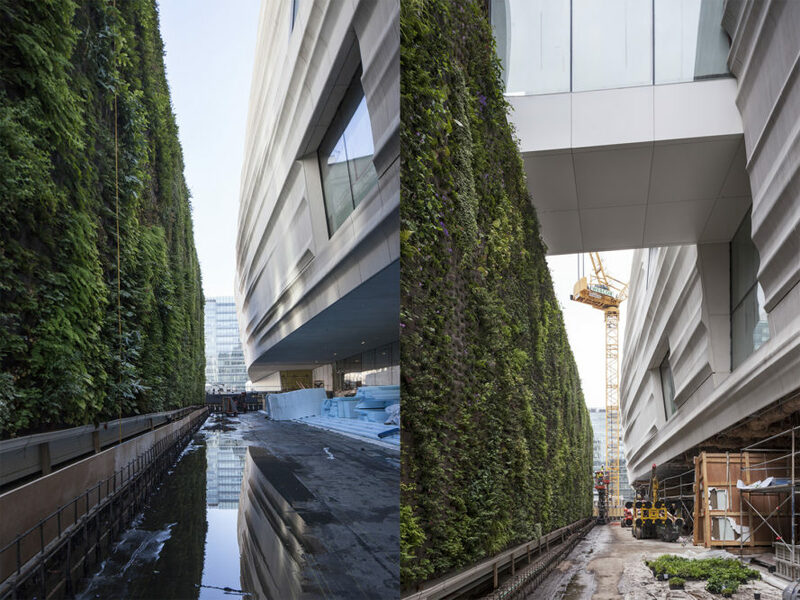 While Snohetta’s new design and the museum’s dizzying amount of art—there are 19 inaugural exhibitions—will be the main draw to many, we have our eye on another museum addition: the SFMOMA Living Wall. Part art, part landscape architecture, the giant living wall designed by Habitat Horticulture is the nation’s largest public green wall of native plants that also boasts impressive eco-friendly elements. The massive living wall stands at nearly 30 feet in height and stretches to a width of 150 feet. 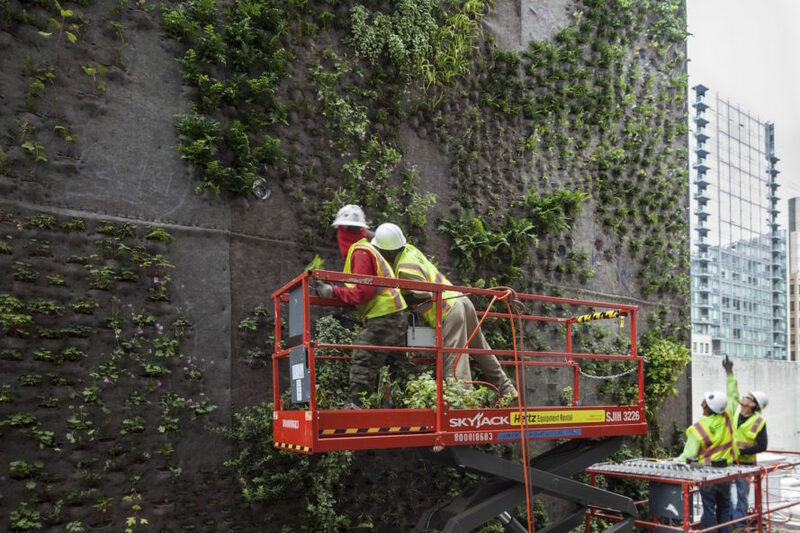 David Brenner, Founder and Principle of Habitat Horticulture, designed the SFMOMA Living Wall as a natural extension of the California landscape. Since the green wall is located in a fairly shaded area, Brenner drew inspiration from the understory plant community of California’s woodlands and created a highly textured planting plan evocative of the forest floors of Mount Tamalpais, Muir Woods, and the East Bay Regional Parks. The final design comprises 19,442 plants with 37 different plant species, 21 of which are native to California and the San Francisco Bay Area. The living wall offers a multi-sensory experience that attracts not only visitors, but also local fauna like birds, bees, and butterflies. Certain plants will undergo seasonal changes and create an ever-changing play of texture and colors. The felt used to hold the plants is made from recycled water bottles and recycled polyester. To save on water usage, condensate water—a byproduct of the museum’s air conditioning units—and stormwater are recycled for use as irrigation. Any runoff from the wall is also captured and reused to reduce water use by 60%. Excuse me? I don't see any plant species in any of your photos that are native to California. What do you mean by 'native' and who told you these are native plants? Excuse me? These are not native plants. In fact I don't see a single plant native to California in any of these photos. The massive living wall stands at nearly 30 feet in height and stretches to a width of 150 feet. 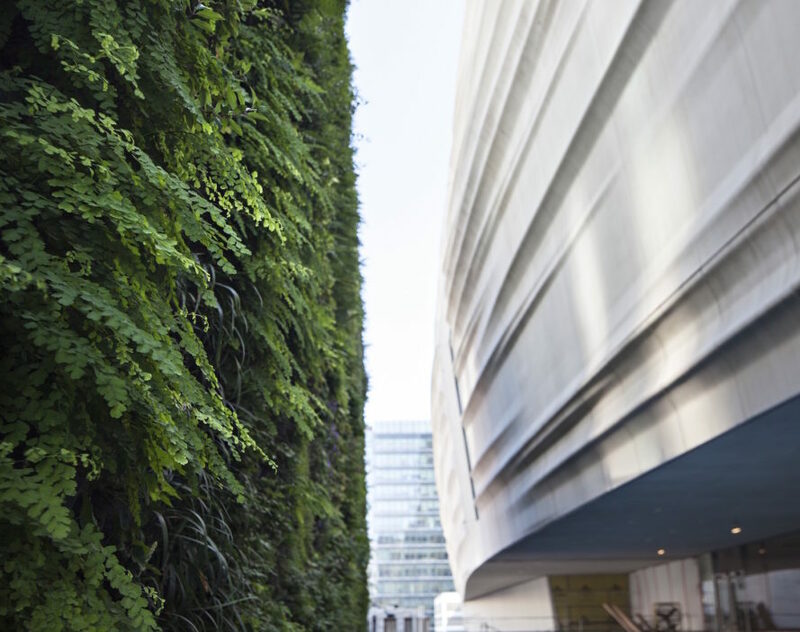 David Brenner, Founder and Principle of Habitat Horticulture, designed the SFMOMA Living Wall as a natural extension of the California landscape. The final design comprises 19,442 plants with 37 different plant species, 21 of which are native to California and the San Francisco Bay Area. To save on water usage, condensate water—a byproduct of the museum’s air conditioning units—and stormwater are recycled for use as irrigation.